In the context of Domain-Specific Modeling Language (DSML) development, the involvement of end-users is crucial to assure that the resulting language satisfies their needs. In our paper presented at SLE 2017 in Vancouver, Canada, on October 24th within the SPLASH Conference context, we discuss how crowdsourcing tasks can exploited to assist in domain-specific language definition processes. This is in line with the vision towards cognification of model-driven engineering. Indeed, crowdsourcing has emerged as a novel paradigm where humans are employed to perform computational and information collection tasks. In language design, by relying on the crowd, it is possible to show an early version of the language to a wider spectrum of users, thus increasing the validation scope and eventually promoting its acceptance and adoption. Ready to accept improper use of your tools? We propose a systematic (and automatic) method for creating crowdsourcing campaigns aimed at refining the graphical notation of DSMLs. The method defines a set of steps to identify, create and order the questions for the crowd. As a result, developers are provided with a set of notation choices that best fit end-users’ needs. We also report on an experiment validating the approach. Improving the quality of the language notation may improve dramatically acceptance and adoption, as well as the way people use your notation and the associated tools. Essentially, our idea is to spawn to the crowd a bunch of questions regarding the concrete syntax of visual modeling languages, and collect opinions. Based on different strategies, we generate an optimal notation and then we check how good it is. In the paper we also validate the approach and experiment it in a practical use case, namely studying some variations over the BPMN modeling language. The full paper can be found here: https://dl.acm.org/citation.cfm?doid=3136014.3136033. The paper is titled: “Better Call the Crowd: Using Crowdsourcing to Shape the Notation of Domain-Specific Languages” and was co-authored by Marco Brambilla, Jordi Cabot, Javier Luis Cánovas Izquierdo, and Andrea Mauri. You can also access the Web version on Jordi Cabot blog. DEVELOP WEB AND MOBILE APPS through prototypes, then change them as many times as you need. No more time wasted building mockups on paper. NO VENDOR LOCK IN thanks to highly optimized generated code that is open, human readable and based on the most recent Java and JS frameworks. DEFINE A CUSTOM WEB OR MOBILE FRONT END for your BPM App and create a customized user interface, giving every channel a different user experience. SUPPORT YOUR USERS’ MOBILITY thanks to the mobile BPM capabilities that let you work on your BPM App on any device, desktop or mobile, and deliver a seamless user experience. 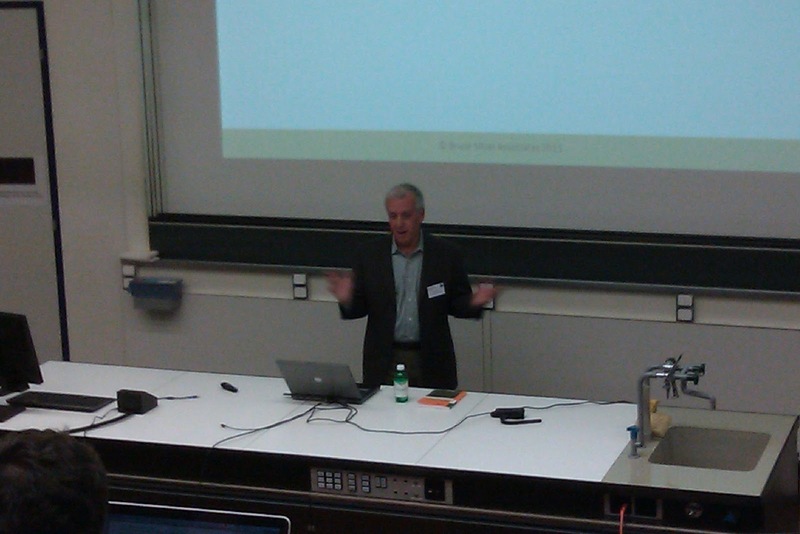 Last week I have been attending WWW 2012 in Lyon and within it I joined the First International Workshop on Crowdsourcing Web search (CrowdSearch 2012) on April 17 to April 20 in Lyon, France. I enjoyed a lot the technical contributions and the extremely lively discussion and feedback from the audience (50+ people throughout the day). The program of the workshop can be found here. I also presented a paper on Model-driven techniques for crowdsourcing search, based on WebML, BPMN, model transformations, and the Search Computing approach. RT @MarcoBrambi: #crowdsearch2012 proceedings available online http://t.co/RuHnzoBK. A lot of discussions are ongoing on the motivations and role of social BPM, in particular on how and when it should impact on the classical BPM lifecycle. Exploitation of weak ties and implicit knowledge: the goal is discovering and exploiting informal knowledge and relationships to improve activity execution. Transparency: the goal is making the decision procedures internal to the process more visible to the affected stakeholders. Participation: the goal is engaging a broader community to raise the awareness about, or the acceptance of, the process outcome. Activity distribution: the goal is assigning an activity to a broader set of performers or to find appropriate contributors for its execution. Decision distribution: the goal is eliciting opinions that contribute to the making of a decision. Social feedback: the goal is acquiring feedback from a broader set of stakeholders, for process improvement. Knowledge sharing: the goal is disseminating knowledge in order to improve task execution; at an extreme, this could entail fostering mutual support among users to avoid performing costly activities (e.g., technical support). To attain these objectives, the social BPM features (or levels of adoption) must be incorporated into the business process lifecycle. While participatory design obviously impacts more in the design and modeling phases, the social enactment and participatory enactment apply on the execution phase. Finally, process mining involves some technical aspects at execution time (e.g., logging of events) but then plays its role mainly in the monitoring and optimization phases. 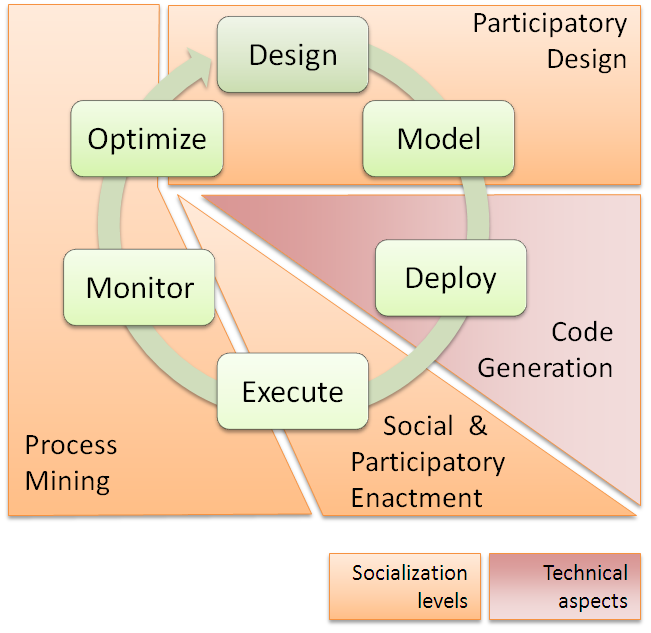 I wish also to highlight that, when the model of the social process is consolidated, the deployment phase might also play an important role: it consists of a the technical phase that produces the actual executable version of the social process enactment application. This task might be complicated by the need of interacting at runtime with social software to support the social interactions required by the process model (in case of social or participatory enactment). These platforms are available online and can be used as a service in the enactment of the process (e.g., LinkedIn for skill and people search, Doodle for decision distribution, etc.). However, the integration of the BPM runtime to the social services is a nontrivial task, complicated by the absence of an interoperability standard masking the technical details of the APIs of each different platform. To face this problem means to support easy and quick deployment, which is a critical enabler for convincing the management to embrace some social approach with limited cost. For that one can rely on technical architectures and development tools that automate the generation of process enactment applications from Social BPMN process models. We will delve further into these issues thanks to a research project called BPM4People that has been recently funded by the European Commission within the 7FP Capacities program for SMEs. Do you see any other possible motivations or impacts of social BPM? You can also find some audio lessons on WebML on my official web site. Trends and challenges in Business Process Management (BPM). The seminar was very successful, with more than 50 participants (see some pictures below). data-centric BPM: how to integrate data and process modeling, by combining MDM (Master Data Management) and BPM, so as to achieve less expensive integration between BPMS and DBMS. Besides highlighting the needs and trends, the workshop discusses the visions of the major players and analysts in the field and proposes some approaches to the problem, with special attention to MDD (Model Driven Development) as a possible solution. To make the discussion more concrete, the MDD approach is exemplified with the WebRatio development environment. I attended the 5th Model driven architecture and agile forum in Milano on September 30th. If IT departments of large enterprises don’t change, they are doomed to end up cleaning the floor and changing light bulbs. Entire IT division role need to be reinvented. Basically CIO role shall become_ to automate the business processes throughout the company, and even better: to optimize the processes, more than just automate (otherwise: risk of commoditization). Business Ecology Initiative: Green economy also means no redundant or inefficient processes. This and other communities of practice like: BPM/SOA, Green CIO, CyberSecurity, … are part of the current OMG strategy for sharing and exploiting experiences between companies. Models are going mainstream in the near future: “By 2013 graphical models in software will be used in more than 80% of new compositions” [Gartner]. And the purpose of standards is not to drive industry to a unique notation, but to make adaptation easier. BPMN is not able to bridge the gap between IT and business per se. However, it can combine with other languages, such as SoaML to solve the issue. Btw, this is in line with what we are doing now with WebRatio BPM: we integrate BPMN with WebML (and all its design dimensions) to address the gap and grant quick design and implementation. TOGAF and MDA integration is crucial for making the first work and the second actually implemented in the enterprise. I see TOGAF as a rather heavyweight methodology (à-la ITIL). Executable models: they are not just models, they are intended as part of implementation and for verification. They are built under the assumption that construction is less costly than design. Now with executable UML models (xtUML) you can describe your actions and perform them on the models. Thus MDA and Agile can merge, thanks to model compilers and alternative techniques. Why does it happen now and not 20 years ago? The question is: what are we modeling? software systems or business solutions? We need strategic synergies betweeen Business strategies, SOA, BPM, and EA. Each of them in isolation can produce incremental results only.. Architectural models and requirements must be contextual, collaborative, consumable (i.e., understandable) and connected in nature for being useful and integrated in the business strategy of the enterprise. How to get there? Semantics of the EA plan is not the same of the one in the BPM tool. You need to understand where is your work located: at business level (BPM), at information system level (business dependent IT), or at technology level (business independent IT). Each of them has his own “tribe” of people and will have its own tools and models. But remember that copying is evil, even at the enterprise planning level. You shall not copy, but only define and preserve links between the levels and the models. Software integrators will not disappear, but will need to change their activities basically to BPM integrators. UML 3.0 will be out in 1.5 years or so. Now the working group is building the first draft. If you don’t have a success measure for your BPM/SOA project, you are at risk of failure. Some KPIs must be defined and obviously must benchmark the processes before and after the project. BPMM (Business Process Maturity Model) can be used for that too. About SOA, people tend to focus on reuse as the main advantage. But this is not the only aspect. About standards: as anybody knows, they are not complete enough to grant interoperability of models or diagrams. You may choose to buy all the best of breed tools and make the integration yourself, or you can buy an integrated toolsuite and make the seller integrate it in your business.Standards are only the common denominator of all the producers, they cannot cover all the cases and scenarios. Attendees to the event mainly included people from banking, software integration, (BPM and MDD) software producers, and consulting companies.